Eggs – Healthy to Eat? Eggs were for a long time considered terrible for you because of the cholesterol. While it is true they are high in cholesterol, more recent studies show that the cholesterol they contain is not absorbed completely by humans, reducing the risk. Still further studies show they may be healthy for you. The studies are mixed, but in the interest of showing the positive side which is either the small end or the big end if you are from Lilliput… Here is a recent study. If you’re eyeing up your breakfast options and fancy going to work on an egg, there’s no need to hold back. For after years of telling us to shun them as an everyday food, the health police now say that eggs have become better for us. The cholesterol content of eggs – which was previously believed to be a health risk – is now much lower compared with ten years ago, a study suggests. Eggs also contain more vitamin D, which helps protect the bones, preventing diseases such as osteoporosis and rickets. 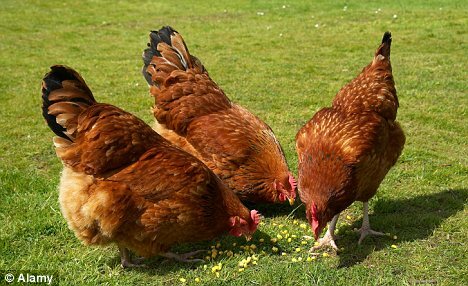 The reason eggs have become more nutritious over the past decade is that hens are no longer fed bone meal, which was banned in the Nineties following the BSE crisis, the researchers claim. Instead the birds are normally given a mixture of wheat, corn and high-protein formulated feed, which makes their eggs more wholesome. A U.S. government study found that modern eggs contain 13 per cent less cholesterol and 64 per cent more vitamin D compared with a decade ago. 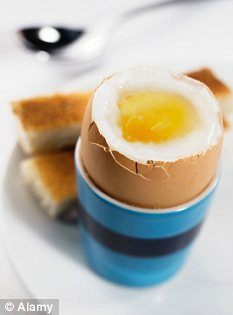 This is backed by British research which shows that a medium-sized egg contains about 100mg of cholesterol, a third of the 300mg recommended daily limit. Two years ago Canadian researchers claimed that eggs actually helped lower blood pressure. They suggested that when eggs are digested they produce proteins that mimic the action of powerful blood pressure-lowering drugs, known as Ace inhibitors. A recent Surrey University study found eating one or two eggs for breakfast could help with weight loss as the high protein content makes us feel fuller longer. The study, which involved volunteers eating two eggs a day for 12 weeks, also found that none had raised cholesterol. 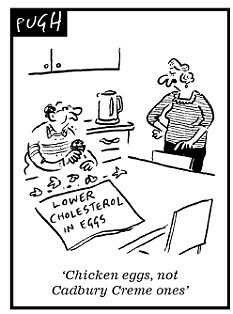 In the Sixties many Britons ate up to five eggs a day but by the Nineties this had dropped to two or three a week – in part due to warnings about high cholesterol levels. Charles Saatchi, husband of TV chef Nigella Lawson, recently claimed to have lost five stone by eating eggs for breakfast, lunch and dinner. ← Can New Bra Detect Breast Cancer?